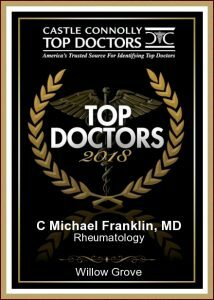 Congratulations to Dr. C. Michael Franklin, MD for receiving the 2018 Top Doctor Award. Top Doctor Awards specialize in recognizing and commemorating the achievements of today’s most influential and respected doctors in medicine, and reassures patients that their doctor is one of the most experienced, skilled, and trusted in the field. Our doctors frequently lecture for local medical schools and at rheumatology conferences worldwide. If you’d like one of our rheumatologists to speak at your event, please call us at 215-657-6776.